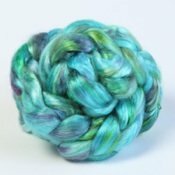 Phoenix – A hand dyed blend of 70% Merino & 30% Silk. This fibre drafts and spins easily and makes a beautiful lustrous felt..
Solitaire – A grade mulberry silk – finest quality silk fibre for spinning, hand dyed. Produces the most beautiful lustrous colours.